We at EZWebPlayer develop the environment to give you right-featured video hosting and playing services with personal customer service at an affordable price. And we partner with Amazon Web Services to deliver our platform. We chose Amazon Web Services because of their deep and broad infrastructure. Amazon’s S3 and CloudFront service with unlimited storage, cloud-based lightning-fast speeds, and reliable 24/7 deployment are unique in the web video hosting industry. Subscribe to our White Label CUSTOM Plan and you get all this: -Complete administration console branding, -Sub Account logins, -Custom domain-branded players, -Domain-branded video sitemap, -Domain-branded video landing pages, -Reselling and much more! EZWebPlayer’s White Label CUSTOM allows you to avoid the enormous cost of platform development— you simply "skin" (customize) our site to look like yours. You can use our technology for your own needs while you resell it. Archived, On-Demand videos are the mainstay of the web video industry. But, EZWebPlayer makes even standard on-demand video come alive and over the top with complete control of the Player like no other web video host. Every control and nuance of the Player is under your control. And, the same is true for live streaming with EZWebPlayer. Every level of our environment offers something more than the humdrum load and play. Live Streaming for small, medium or enterprise businesses as well as not-for-profit applications like church services and benefit telethons is handed to you with expanded tools and features. After the straight forward setup is completed, you can start any live stream event, whether small or large, one-time or frequent, with just one click and includes Auto-Archiving. EZWebPlayer’s partnership with Amazon gives you affordable pricing backed by personal customer service. Supports ALL major video formats– plays virtually ANY video. It makes absolutely no difference what format your source video starts out as. If it is on your hard drive, and you want to share it at large or privately, we can find a way. From easy to hard cases, our Support guys are masters at getting video on the web. The list is too long to post here. So, we’re linking to it for you here. [link to lists] If it can be made to go on the web, then EZWebPlayer can play it. 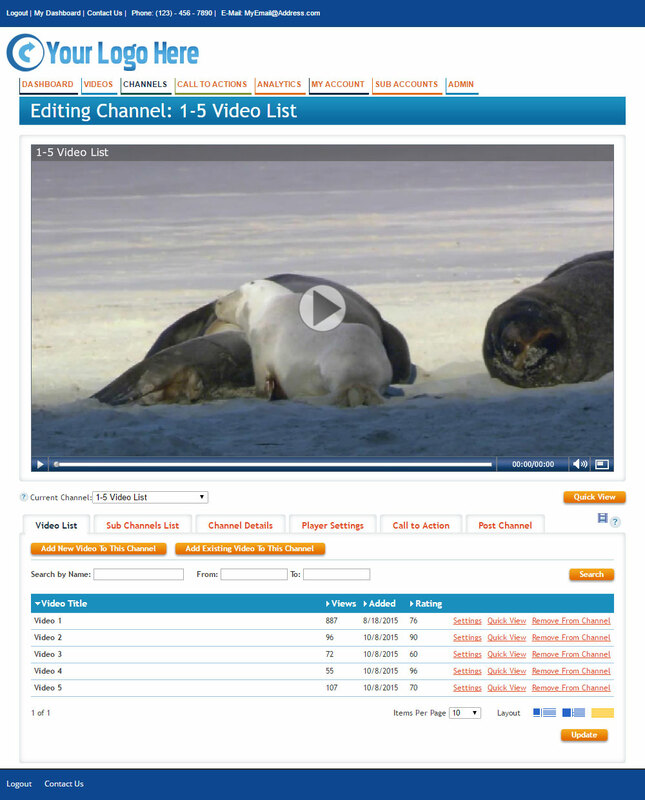 At last count, there are about 150 video and 85 audio file types and codecs that are compatible through EZWebPlayer’s transcoder, and we are constantly updating as needed. The rest (an extremely short list) simply need converting to a compatible file type before uploading. EZ organization for you and your staff— Increased views from your audience. EZWebPlayer’s powerful and deep organization structure is called Channels. Planning ahead and organizing once saves huge blocks of time. But the best part is, Channels allows your viewers to easily access your library and choose the videos they want to view, or you want them to watch. When getting your story out is mission critical, branded Channels is the way to go. Add serious traction with pre-roll, post-roll, and popup advertising CtA’s. 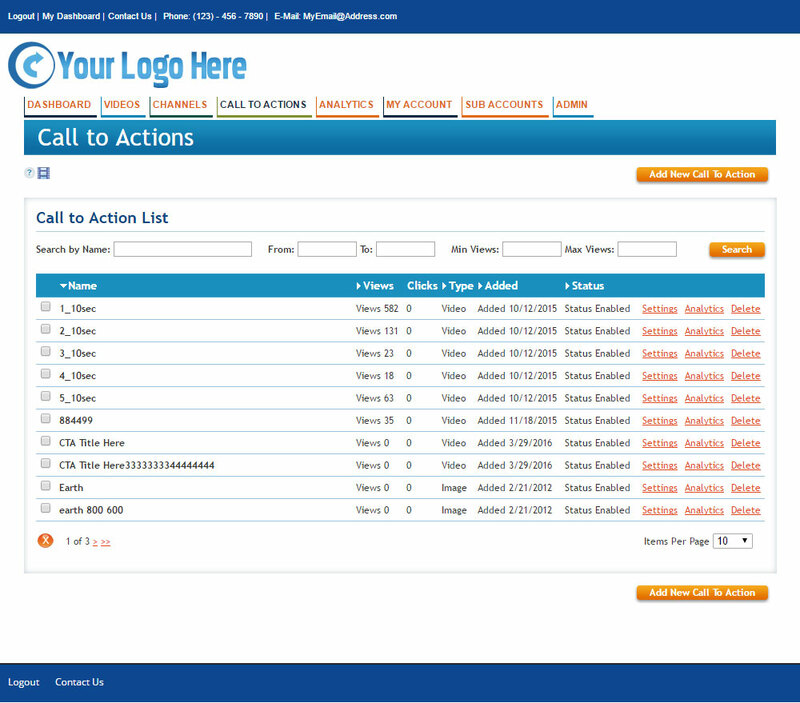 Adding Calls to Action to videos can boost your income. Advertise your own product or service, or sell advertising space to others. EZWebPlayer gives you several EZ ways to cash in on advertising. 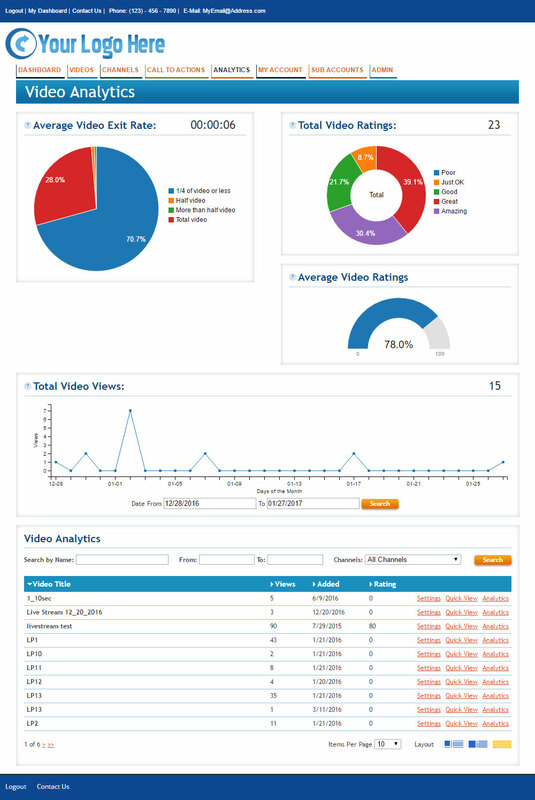 Track your viewer stats in at-a-glance and detailed displays. Whether you’re sharing videos to entertain, to sell products and services or to educate and inspire, the videos can’t just “look good”– they MUST perform. EZWebPlayer’s analytic tools give you precise metrics to determine a wide range of performance aspects so that you can make the most of your web video assets. Keep your videos climbing towards that sweet spot where they are gaining the most real traction possible. Player controls and interaction devices— turn them on and off as needed. These are YOUR players and you want them to operate YOUR way, so we allow you to make them appropriately unique but still uniform for a truly top level appearance and user experience. There is no limit to the number of unique Players you can create and save. Reach more and do more with custom domain branding. Make the Player truly yours as well as making it fit seamlessly into your web site if you want. Allow your videos to reach out to your viewers with your own custom logos and messaging with a seamless message of professional stature. Every video, every view, with your identity. When you own your own video platform, YOUR corporate name, logo, and ID are the only ones viewers see. When you have that branding exclusivity, all the focus is on your brand, not on a third-party hosting service. Slash your video's sharing URLs down to size: just a few characters. This creates SHORT, easy-to-communicate, branded urls. Video Landing Pages have endless options to benefit your website and keep your visitors on your site longer. 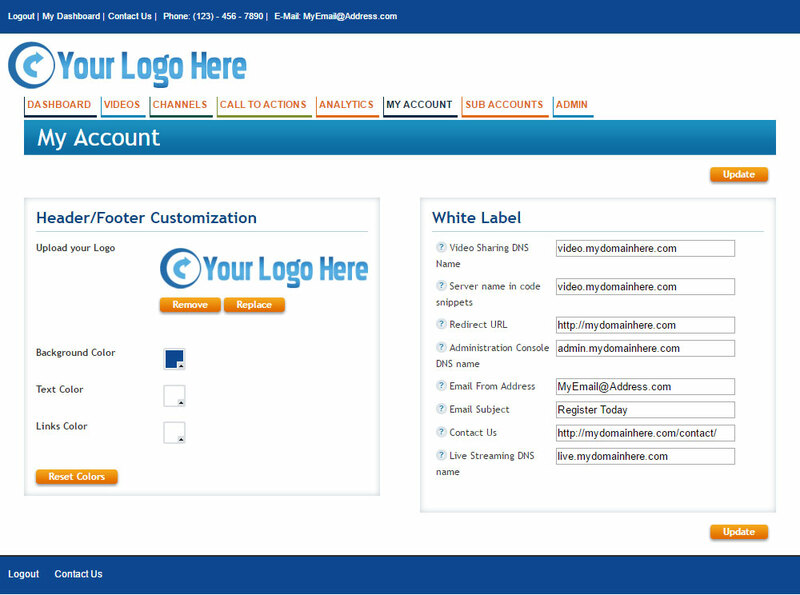 With EZWebPlayer’s White Label package, you can easily create endless configurations for a video landing page to promote your business, organization, product or brand. And, this is quite possibly the most powerful and direct pathway to your successful LPO (Landing Page Optimization). 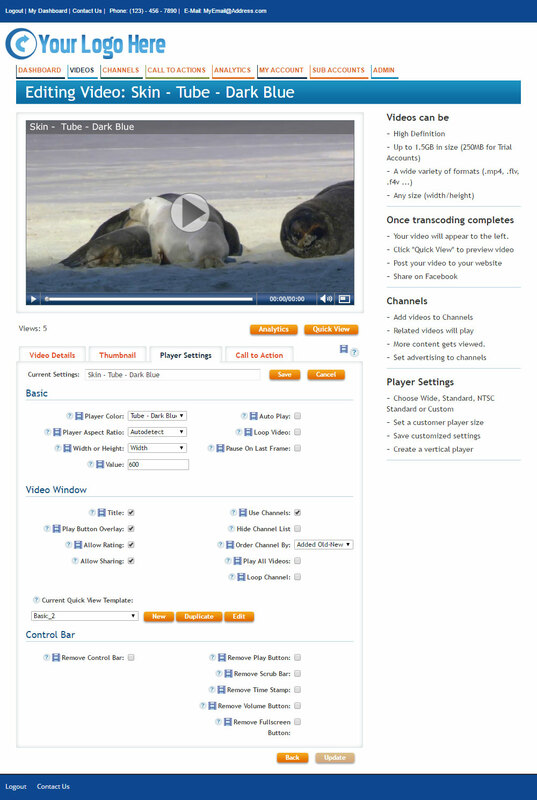 EZWebPlayer’s mission is to make it easy and affordable for you to store and share as many videos as you wish. One of our three plans is sure to fit your specific needs. All of our plans have tons of great features, many of them unlimited. But all our plans have limits, including NUMBER OF DAILY VIEWS. The limit is extremely large, allowing you to operate and share videos without worrying about bandwidth and extra costs. Simply pick a plan that makes sense and you are good to go. How does 5,000 views per day sound? See how many you are getting now with your current provider. Need more? We have a plan.